The latest update to Valve's Steam usage statistics reveals that 4.69 percent of Steam users were running Microsoft's Windows 8 operating system in November. 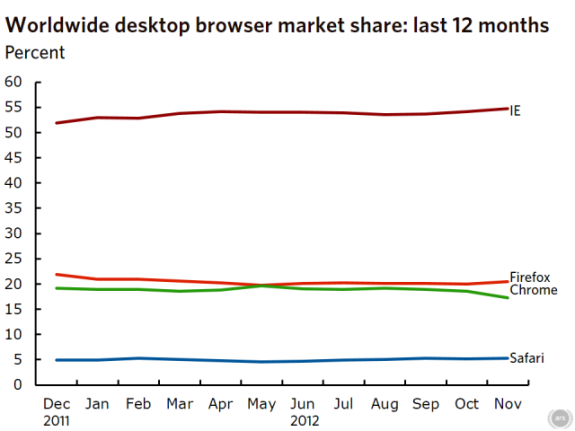 As The Next Web points out, that's quite a good figure for the few weeks that Windows 8 has been on the market. Despite harsh comments from several game developers, including Valve's Gabe Newell and Minecraft developer Mojang, gamers seem to have no qualm upgrading to Windows 8. For a nascent and controversial operating system, that figure is hardly poor. OS X, for example, across all its listed versions, controls but a mere 3.26% of the Steam market. Steam, a massively popular gaming platform and store for PC gaming, is a key component of the larger game market. That Windows 8 has managed to snag nearly 5% heading into the holiday seasons may imply that by the end 0f Q1 2013, Windows 8 could account for a firm 10% of the Steam usage base. As you certainly expected, Windows 7 retains the largest piece of Steam usership: 72.56%. ARS Technica on the other hand analyzed the more general web usage statistics from Net Marketshare and found that 1.09 percent of web users were using Windows 8 in November 2012. The new Internet Explorer 10 doesn't seem to be an instant hit though, only 47 percent of Windows 8 users stick with IE10, much less than the 60.0 percent of Windows users overall that use a version of Internet Explorer. In November, Internet Explorer remained king in the desktop browser market with a marketshare of 54.76 percent, while Firefox climbed back up above 20 percent. Chrome on the other hand dropped 1.31 percent to 17.24 percent, but according to Net Applications part of this drop can be attributed to the exclusion of Chrome's pre-rendering data. The research firm estimates that 11.1 percent of all Chrome pageviews are a result of pre-rendering, where Chrome renders pages that aren't currently visible just in case the users wants to see them. These pageviews are now no longer included in the statistics.